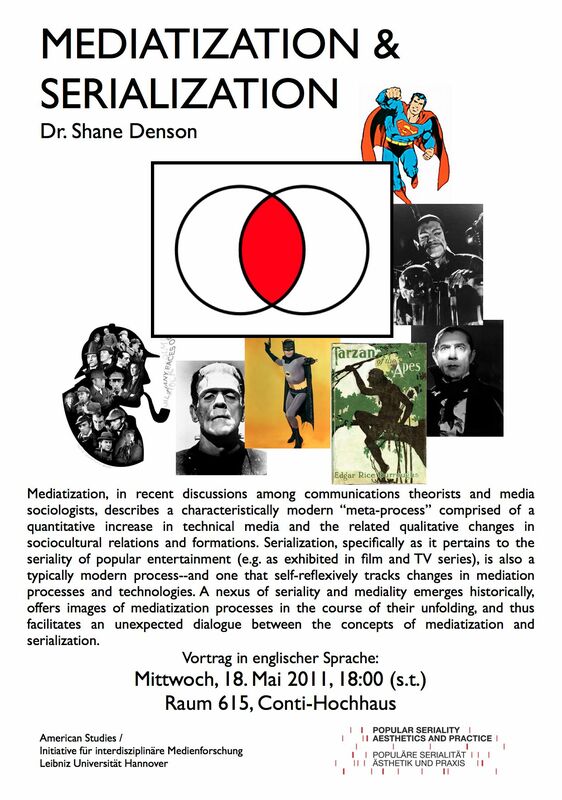 shane denson — media theory. post-cinema. seriality. techno-phenomenology. postnaturalism. and other stuff. This paper looks at the preeminently mediatized worlds of modern popular entertainment and sets them in relation to debates over the apparent centrality of media in the articulation and execution of contemporary human agencies. Theorists of mediatization have argued that “the mediation of everything,” as it is implicitly or explicitly postulated in recent media studies research, both captures something essential about our changing lifeworlds but, because of a latent determinism, also stands in the way of countenancing these changes rigorously and responsibly (Livingstone, Hepp). Recent suggestions to the effect that analyses of mediatization processes require a non-media-centric media theory (Hepp, following Morley) seek to counteract deterministic tendencies by highlighting the extra-medial (e.g. social and cultural) forces that increasingly situate media at the center of mediatized lifeworlds while, at the same time, demonstrating that these media retain a high degree of flexibility with regard to the variety of contextual logics and implementations that they can accommodate. Drawing on the work of American philosopher of technology Don Ihde, I would like to propose “techno-phenomenology” as a tool for conceptualizing the mediatization of lifeworlds in this paradoxical or “de/centered” sense. This approach shows technologies as possessing “telic inclinations” or logics that can invisibly transform perceptual and actional agencies and the lifeworlds in which they are embedded, while comparative analyses demonstrate that these tendencies are far from absolute: technical logics are emphatically plural, for intentionality-modulating technologies can occupy a variety of positions within the basic intentional relation. For example, media can be either transparent or opaque and ostentatious, thus instituting a space for reflection on their role in the lifeworld that they in part structure. In the sphere of modern popular entertainment, a techno-phenomenological approach reveals that reversals and variations of a medium’s position and significance within the intentional relations between audiences and the entertainments they consume are an integral part of these entertainments themselves. In other words, the mediatized world of popular entertainment is characterized by repeated interrogations of its own mediatization processes and their larger place in the modern world. Mediatization itself is problematized and put on display in popular media, e.g. when new media emerge or existing media are transformed. This is nowhere more evident than in serialized forms of entertainment, which, due to their development over time, are capable of tracking mediatization processes in the very act of their unfolding. Self-reflexively de/centering the media involved, popular serial forms tell stories that are as much about media as about the contents they mediate; and in the feedback loops that emerge between producers and consumers of popular series, media centrally structure both the form and content of communicative interaction, establishing a dynamic of self-propulsion that is nevertheless not strictly deterministic. Serial forms of popular entertainment therefore both display and enact the de/centerings that constitute a central paradox of our mediatized worlds. Hepp, Andreas. “Researching ‘mediatized worlds’: Non-mediacentric media and communication studies as a challenge.” Media and Communication Studies Intersections and Interventions. Eds. Nico Carpentier, Ilija Tomanic Trivundža, Pille Pruulmann-Vengerfeldt, Ebba Sundin, Tobias Olsson, Richard Kilborn, Hannu Nieminen, and Bart Cammaerts. Tartu: Tartu UP, 2010. 37-48. Ihde, Don. Technics and Praxis. Dordrecht: Reidel, 1979. _____. Technology and the Lifeworld: From Garden to Earth. Bloomington: Indiana UP, 1990. Livingstone, Sonia. ‘On the Mediation of Everything’, Journal of Communication 59.1 (2009): 1-18. Morley, David. ‘For a Materialist, Non Media-Centric Media Studies’, Television & New Media 10.1 (2009): 114-16. _____. Media, Modernity and Technology. The Geography of the New. London: Routledge, 2007. I’m being targeted with phishing attacks — from my employer! The Rebirth of the Blog?